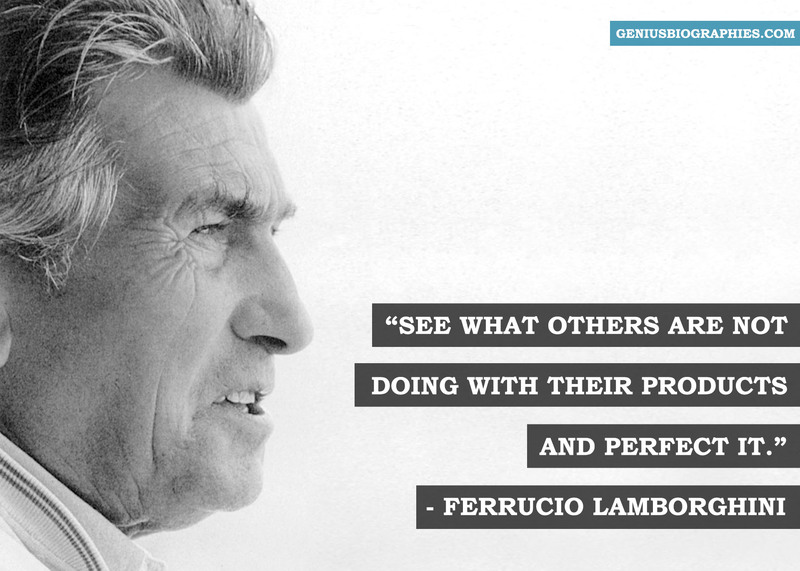 Life wasn’t easy for Ferrucio Lamborghini on the the farm, as his main interest lay in machinery. He loved taking things apart and putting them back together. He was even able to build his own casting shop in the barn. Once when he was casting his own parts for the farm equipment, the barn blew up and the family lost almost everything they owned! But it was this curiosity and love for machines that propelled him from a farm hand to a tractor business owner to the owner of a sports car brand that became synonymous with luxury, refinement & perfection. After going to technical school in Bologna, he developed a deep desire to know how everything worked. Later, he joined the Italian Air Force in World War II. Being able to fix military equipment with very little spares, he earned the post of chief mechanic. Once the war was over – while on his honeymoon – he saw that a lot of surplus military vehicles were being sold off as scrap. Recognizing an opportunity in this, he cut short his honeymoon and started building a tractor out of the parts of the surplus vehicles, for his parents’ barn. The fame of the tractor grew and other local farmers came to ask him for the same design. He continued building tractors for the locals and realized that he could design a single tractor from the surplus vehicles in 30 days. After selling off many such tractors, he was able to buy his own material and formalize the business. By mid-50s, Lamborghini was a millionaire. Out of spite, Lamborghini opened up the car to see how he could improve it. Having found quite a few faults, he put in a better clutch and made some replacements and improvements. This design of his too, did not go unnoticed and people began to ask about it. He realized that if he used his tractor parts, he could save the cost on parts. Thus he shifted his gaze to this sector and set up the Automobili Lamborghini S.P.A facility. His brand cars beat the best of the best high-performance cars, the Ferraris and Alfa Romeos of those days, and carved a niche for itself as the pinnacle of performance, style, and technical excellence. Lamborghini was also known for being courteous. He treated his employees and visitors with equal grace. He remained approachable and allowed new ideas to proliferate. He believed that there were tons of ingenious ideas but there were not enough people to perfect them. Never let critics get you down.